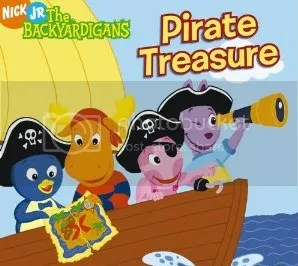 Although this is not the first episode listed on the DVD, “Pirate Treasure” deserves to be reviewed first because, well, it is the first episode! Even though “Pirate Treasure” premiered when Pirates of the Caribbean fever was still rampant, it is not a parody or spoof of that movie. Rather, it is showcasing a typical children’s adventure game, only with telescope swords and bubbling mud pits. Although the series will eventually take on much more sophisticated and satirical storylines, it is to the writers’ credit that they started off with something so simple and yet still managed to put a unique spin on it. The musical style is ska and reggae, having Jamaican and Caribbean origins, respectively. The songs are amazingly catchy, with “A Pirate Says ‘Arr’” being a solid earworm. Three out of the four songs are original, written and composed by McPaul Smith and Evan Lurie. The fourth is “Scurvy Pirate,” the tune perhaps better known to adults as “Drunken Sailor.” Naturally, the lyrics were altered to be more appropriate and also to move the plot along. The first character we are introduced to is Uniqua, a strong female character who is just like “one of the boys,” yet is obstinately a girl – and quite proud of it. There are better episodes in which to discuss Uniqua’s wonderful qualities, but it’s important to point out that they were there from the start. Uniqua leads the first song, which sets up the story. She and Austin have half a map with which they are going to find treasure, and Pablo and Tyrone have the other half. The actual backyard defies time and space to suit the characters’ vivid imaginations, and trees and grass transform into old-fashioned wooden ships and an expansive ocean. The two groups sail merrily until they meet up – or rather, Tyrone and Pablo decide to “capture” the others’ ship. By then, of course, the ship has crashed into a desert island, the exact place on their respective maps. The actual plot and dialogue have been nothing special up to his point, and it all seems rather predictable until both duos realize that together they have a whole map. To them, the obvious solution is to work together and find the treasure as a team. There is no whining or complaining, no turning to the “audience,” asking what ought to be done – it’s a logical solution for young children to make and Backyardigans accomplishes this without being too heavy-handed. Pablo: Is it the “X”? Eventually, of course, they do find the “X,” next to a set of shovels [Tyrone: “Well, that certainly is convenient.”] and dig up the treasure. Unfortunately, the treasure is just one enormous diamond, unable to be split up. Like the combining of the two groups earlier, the characters do the obvious thing: they share it. Then they bury it under a “Y,” and go have a snack. In this first episode, there’s already much for children to identify with, especially the sharing of ideas and learning how much can be accomplished by working as a team. Adults can be enchanted by clever dialogue, and the song-and-dance numbers [then have them be stuck in your head for the rest of the day]. The next episode is also on the It’s Great to Be a Ghost DVD, the titular episode. What sort of imaginary games did you play as a child?